Use the included everyday hardware to build some friends, then use your own creativity to make more. It takes imagination to look at a motley pile of familiar hardware and see a four-legged friend. What's awesome about these kits are that the creativity doesn't stop there. 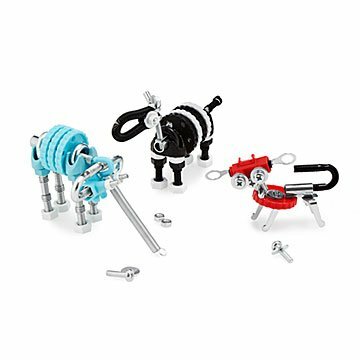 Each comes with detailed instructions for making adorable animals from high-quality steel, non-toxic, painted parts. From there, the kits are designed to be used for your own creations. Upcycle any old piece of unused hardware or spare parts to build a whole zoo if you like, bursting with geeky, goofy personality—a little bit like its maker? Choose from either the 3-in-1 or single animal kit. Made in Israel.